Due to the tremendous generosity of Aquarius Casino Resort guests, team members and ace | PLAYTM card members, the 7th Annual ‘Feed a Family’ program set a record this year by providing delicious meals to 2,000 local families, resulting in 8,000 individuals fed this holiday season. The charitable “Feed A Family” initiative, combined ace | PLAYTM points contributed by card members with cash and credit contributions to provide families in need with meals for Thanksgiving and Christmas. For every 12,000 ace | PLAYTM points contributed, Aquarius purchased a box of holiday food items large enough for a family of four, including: a 7 pound ham or a 12 pound turkey, potatoes, gravy, vegetables, rolls, cranberry sauce, stuffing, pie and whipped cream, which was then donated to local food banks, pantries and distributed to families. The Christmas Tree Silent Auction, another part of the ‘Feed a Family’ program, helped to raise $12,500 and feed 2,500 people by auctioning off 11 fully decorated Christmas trees. The winter frost themed tree was donated to the Sunridge Village Assisted Living, and the peppermint twist themed tree was donated to a local family. Additional purchased trees were donated back to the community. Mission, Kingman, AZ; Havasu Community Health Foundation, Lake Havasu City, AZ; Women’s Club of Needles, Needles, CA; Nana’s Pantry, Kingman, AZ; and United Methodist, Fort Mohave, AZ. More information about Aquarius Casino Resort and reservations are available by visiting www.aquariuscasinoresort.com or calling 702.298.5111. 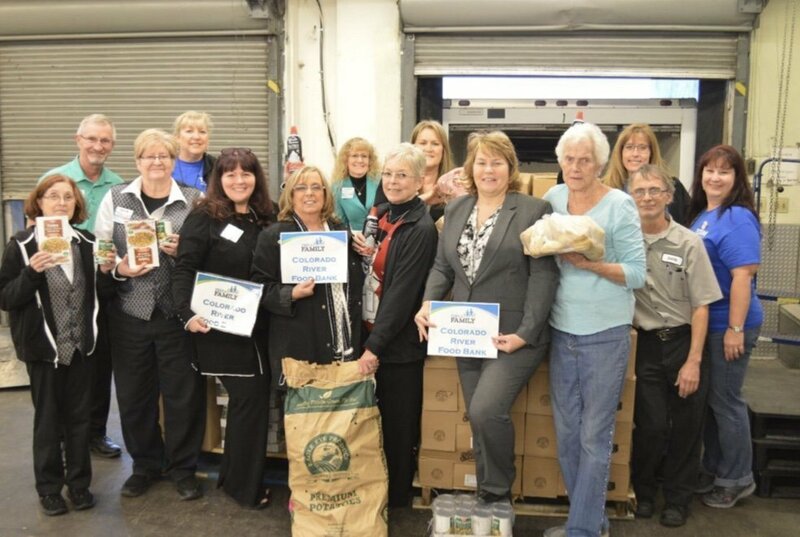 PHOTO CAPTION: Aquarius Casino Resort team members pack up food donation boxes to provide 2,000 families in need with Thanksgiving and Christmas dinner as part of Aquarius’ seventh annual “Feed A Family” program. Aquarius Casino Resort is the largest 24-hour gaming resort in Laughlin providing 1,906 rooms and suites and a 57,000-square-foot casino offering over 1,200 state-of-the-art slot machines, the widest variety of favorite table games, and an all new non-smoking race and sportsbook. The Aquarius Casino Resort offers multiple amenities including restaurants to serve every taste from fine dining to casual dining. For more information, please call (800) 662-5825 or (702) 298-5111. For further information visit www.AquariusCasinoResort.com and check out the special offers and packages section.